Does a Change of Season Signal a Time for a Change in Strategies? May roared by and we’re now into June and summer…not long ago, it felt as though the long winter would never end. As we change seasons, it’s a good time to assess what we’re doing to further our small businesses. I don’t know about you, but I feel as though I need to see my business through fresh eyes. This means taking a look at new and better ways to manage the time and effort we pour into our work. Are there some things that need tweaking? Could we be doing less of the things that don’t move us any closer to our goals while spending more time on initiatives that get us farther faster? As we examine what we could do versus what we’re currently doing, let’s be sure to remember to let others know about all the great things happening at our places of business. One of the best ways to do this is to factor PR into the mix. If you’ve tried direct mail, advertising and other traditional marketing tactics but aren’t seeing the return on investment you’d hoped, why not give PR a try? PR is so effective because of the credibility it brings your company for a nominal cost. Granted, it isn’t a “given” like buying an ad, but if you’re able to get a reporter to cover your story, that carries so much more credibility with potential customers. Why? Because it’s an impartial third party espousing your virtues, instead of you trying to tell people why your company, product or service is so great. How do you get started? Plant seeds—that’s what PR is. 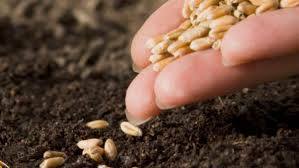 You plant the “seeds” of a story in reporters’ minds and then nurture those “seeds” and hope for something to grow. It doesn’t always happen right away, but when it does, it’s so rewarding. One of the main reasons I do what I do is that there’s no higher high for a media relations expert like me than getting a response from a reporter—it’s absolutely exhilarating to get them to take notice, especially in today’s noisy world. If your pitch stands out in the field of all the pitches they receive, it’s incredibly gratifying. And, if the story actually runs/appears, that’s even better! It needn’t be an extensive campaign to yield results. Just start by looking at what you may have coming up that may be newsworthy. Then, consider some ways to share that news, perhaps through a press release, blog post, social media updates or customer success story. Many times, just one piece of news can be leveraged for multiple uses. Start today to plant the seed that may grow into a story tomorrow. PR is storytelling, but always be in control of the story. When executed correctly, public relations has so many benefits! It’s always important to understand your target audience and cater your message to them. Not only will this help you determine the best method of reaching them, but more importantly, how to make your message stick. We consume countless media daily, so making your business/story/etc. memorable, is crucial.